How do you make a good thing better? 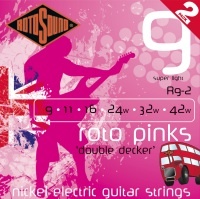 Rotosound are now offering their best-selling R9 and R10 Rotos nickel-on-steel guitar strings in twin set packaging. Rotosound are calling these packs, Double Deckers. By doing this, Rotosound can reduce packaging by around 70% compared to buying two separate packs of strings. This means savings to you too. If you buy your strings in a Double Decker pack you’ll get them up to 20% cheaper than two individual packs. 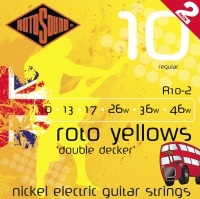 The new Double Decker packs are coded R9-2 and R10-2 and represent Rotosound’s Rotos pink and yellow (or 9 and 10 gauge) string sets. I’d guess we’ll see the Double Decker range extended before too long. More on this over at Rotosound.